Casting Off: We left Cocos (Keeling) Islands at 2:35 in high spirits. The air was alive with excitement and anticipation for our 1,500-nautical mile passage across a big chunk of the Indian Ocean. Our destination: Chagos. Karen had never sailed before Delos. Babs, Frida and Karen enjoying life onshore after so many idle days at sea. It wasn’t long until the euphoria in all of us got replaced by a slight nauseous feeling. 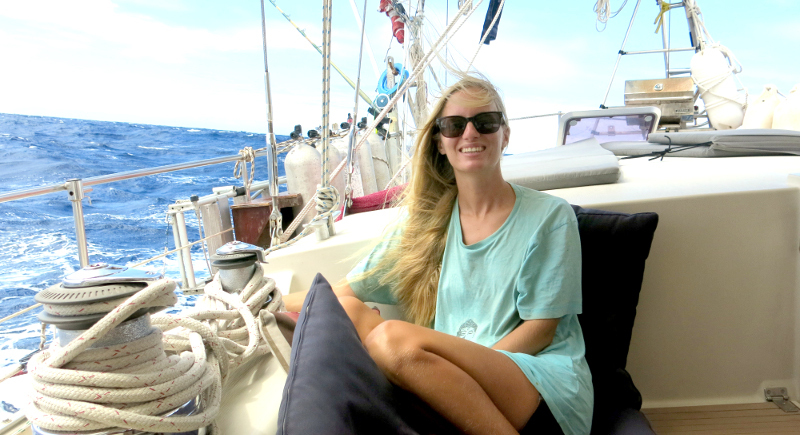 It was blowing a frisky 25-30 knots just off the port stern and Delos was buzzing off her chops, surfing down the three metre swells and cruising up to 12 knots. Babs was hanging off the rail, loosing her cookies, and I wasn’t doing that much better myself, one wrong turn and I would have been there right next to her. The Delos was in her element again and even though I had a hard time keeping my lunch down, this was awesome sailing. We were finally in the trades promising a constant strong breeze. This was awesome! I found myself sitting, staring out into the vast open ocean. And it hit me like it always does when I do this – how small I am and how this open ocean almost feels like a wet desert. I find it incredibly captivating to stare out into the dark blue and see all the waves and clouds roll by, it’s almost the same sensation as staring into the dancing flames of a fire. A trance feeling and time just fades away. I thought about our time in Cocos and how it couldn’t have been more perfect. Since Brian and I came back to Delos seven months back, it has been full-on travelling mode. We’ve been to so many cool places and met so many incredible people, but we’ve been moving fast and it was definitely time to slow down, and Cocos ended up being the ultimate place for chilling. A perfect anchorage, super protected, a constant breeze cooling everything off, clear blue water, internet, a short swim to a perfect white sand beach that had tables, fresh water showers, endless supply of coconuts and hundreds of incredibly cute hermit crabs patrolling the beach. And the list goes on… I had so many of those “top of my life days” there. 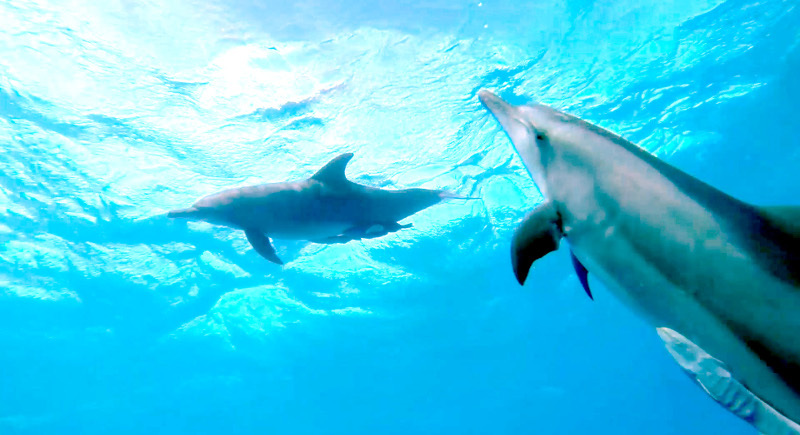 I got to swim with dolphins for the first time in my life, an experience unlike anything else. A five-minute dingy ride from Delos we found a beautiful wall dive spot where we saw mantas every day for a whole week. A crackerjack family that opened their home and hearts to us. Rik, Jo, Kimberly and Hudson really showed us what Cocos was all about. With radio nights, BBQs, boat adventures, beach days and good stories. I sat there thinking about all the amazing times we had in Cocos and before I knew it my watch had ended, the sun set and we where still hooning along at eight knots. This day contained nothingness. A full day where I really didn’t do anything. It’s always like that the first days on passage before my body adapts to its new constantly moving reality. I woke up for my watch, was awake for two hours. Saw the beautiful sunrise, ate an egg. Went to sleep again for two hours. Woke up, ate toast. Sat staring at the ocean, sat on another spot staring at the ocean. Five hours passed then ate a suspect-looking rice mush. Went back to sleep. The best thing with passage is that the days are allowed to just pass by without concrete substance or productivity. I feel no anxiety or bad conscience for not doing anything, it’s okay – it’s how it should be. One of the many things that makes me so fascinated by this vast open blue sea is my fear of it. Not a fear that keeps me up at night and makes me tip on my toes. But the kind of fear that sometimes grips me by the neck and gives me those chills down my spine. As a reminder to keep my respect and understand the extreme power it holds. I only dwell on these thoughts at night. As the sea changes from being invitingly light-blue sparkling hills moving across the horizon only to becoming invisible black mountain crashing around me. I thought about all the safety and warmth Delos gives me. How a small unfortunate circumstance could take all that away. I think my fear mixed fascination with the ocean and the thrill of being so isolated in the middle of this vast landscape is one of the reasons why I love it so much out here. Constantly pushing myself to learn and grow as a person. 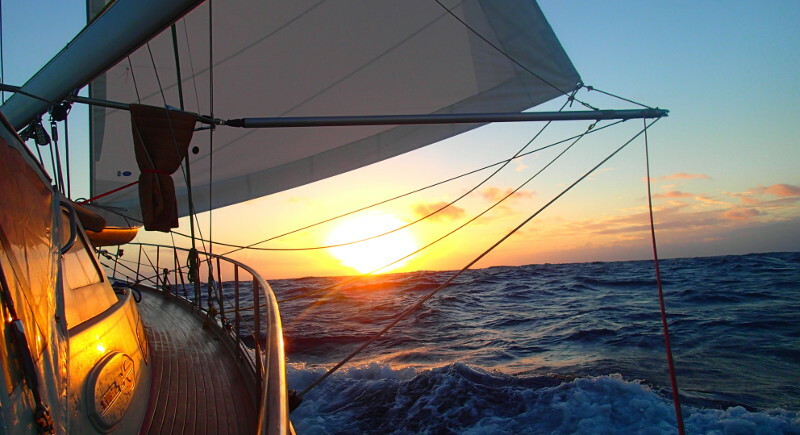 We are halfway (750nm). I’ve never been very clever with distances, but it’s about the length of Sweden, from north to south, which puts it in perspective for me. The hazy feeling in my head and the tight grip in my belly felt like long lost memories. This might have been because the swell had become a lot less intense. Instead of surfing down steep cliffs, Delos was now getting gently lifted up soft hills giving an awesome view of the surrounding vast ocean only to a minute later get lowered down into what feels like a valley with only the hills of water around. Never the less, I was happy to feel like myself again and we all sat up chatting about random dreams, podcasts and creatures of the deep. I wept. I have always been a wimp when it comes to sad movies, documentaries about poor animal treatment or the emotional endings of (the American reality show) ‘Extreme Makeover’. I stared at my watch. It was 6pm and I sat listening to the end of my audio book (Odd Thomas). I started listening to this book two days ago and had gotten really swept into the life of the main character, Odd. The end was extremely sad and I had to restrain myself from falling into a big whimper. I had only two minutes left and felt determined to finish the story. I looked out over the ocean and I could feel my eyes watering, but I still had everything under control. Until Josje came over and asked me if I wanted a taste of her old party snacks before she threw them overboard. This tipped me over the edge and I couldn’t hold my tears back anymore. Because I’d been holding it in for a while, it came out more like a small screamcry than a silent sob. After describing to everyone that I wasn’t hurt and nothing serious had happened, just an emotional ending to my book. I sat staring at the sunset and thought about how incredibly fortunate I am to be right here with all these people that I love. Suddenly everyone is rushing towards the back. Our first hit of the passage. Brian takes the half ripped gloves off the rail and starts pulling in the hand line. It’s a mahi-mahi (dolphinfish), you can see its beautiful yellowand-blue body soaring through the water. Energy is high and just as the fish is within reach, it flicks to the side, hits the side of the boat and bam!… It’s gone. A second later… boom! The other bottle goes off! This time its “Ashrash”, the bigger of the two lures. Brian starts pulling it in. It’s big not a mahi-mahi, but something much longer and less colourful. Cameras are rolling, knife is ready and everyone is holding their breath with excitement. It’s just by the boat, a massive 15kg wahoo! Just over a metre long with sparkling light-blue stripes and a body of a true sea predator: big beak of a mouth, fast sharplooking dorsal fins and a long slim body of muscle. An amazing catch, we will eat like kings for the next few days. Life is good! I wake up to Josje’s soft voice saying, “We’re right at the passage. Time to wake up.” I’ve had about five hours of sleep since my last night watch. I felt a joyful, excited feeling in my belly and it kind of felt like Christmas morning. I walked outside and there it was, the land smell. I never really knew land could smell so much and so special. We were now only a few boat lengths away and it looked awesome. We slowly approached the narrow pass, which is the only way into the Salomon Atoll (in the Chagos Archipelago). With Brady up the mast guiding us in, we had one metre under the keel most of the way. We spotted another boat on the other side of the lagoon and decided to be social cruisers and sail over to say hello. As we got closer, the boat seemed to be anchored boldly close to land and it looked like it was missing a mast. We got closer and the white hull that we thought was another boat was actually a washed up wreck of a catamaran. It looks like its going to be only us… No boats, no people – just Delos and thousands of fearless birds for a whole month.